This morning we had a lovely treat when my friend, and fellow Fife blogger, Kat invited us to her farm to meet the new calves and Jock, the bull. Kat blogs about life down on the farm over at www.lochaberfarm.com sharing her family's journey as they develop their land from empty field to a fully operational farm (she also shares great recipes often using ingredients I would never have thought to use!). We recently received a lovely book about an adorable bull and the day it arrived Kat also shared a photo of her daughter and their bull Jock! A perfect coincidence. It was an absolutely freezing cold morning today but we got our wellies on and BookBairn bravely approached these huge cows and the bull to say hello! She said "the cows are cool, mummy!" but was less impressed about getting her wellies muddy. On the way home in the car I handed BookBairn 'Who's Hiding on the Farm?' by Katharine McEwen which was a great book for BookBairn to explore by herself and will be even better to read together. She lifted the flaps (over twenty in the five double-page spreads) and told me all the creatures she could spot underneath as well as the ones in the fields as we drove home. After the animals (bairns) were fed, The Wee Page Turner picked it up too and started exploring it's flaps too. We will read it together too as there are lots of farm facts that we can learn under each flap. The illustrations are soft and beautifully designed so that there an appearance of texture too. There are so many details to look at too - a lot of time and love has obviously gone in to creating them! I love it when we can bring to life the stories from our books and use books to enhance what we have seen in our real life. That's what it's all about. And today was a wonderful adventure doing both! Thank you so much for having us Jock, farmer Dan and Kat! 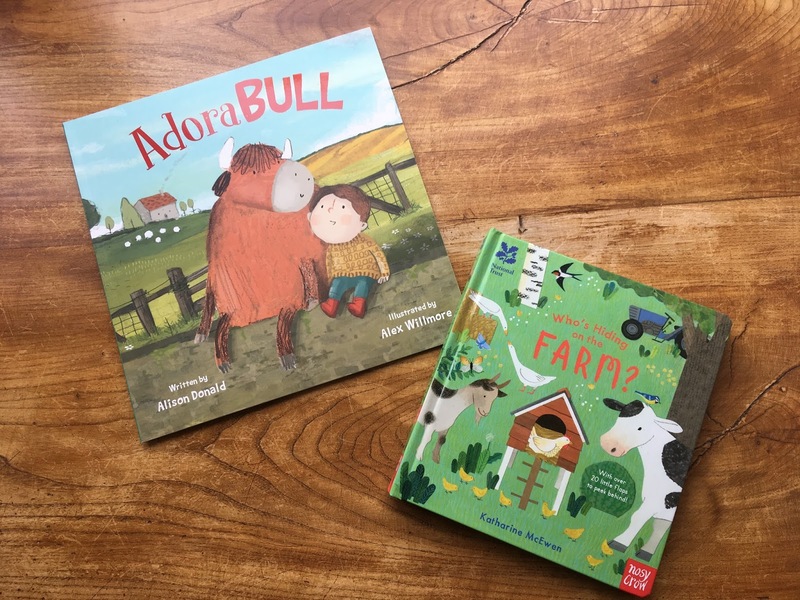 DISCLAIMER: We were sent both these book for review from the publishers but as you can see I loved them so much that I wanted to bring them to life for BookBairn and The Wee Page Turner so you are guaranteed that we love them. And words and opinions are our own! These look like lovely books..... and what a fantastic morning you must’ve had meeting Jock, the bull, and all the new calves. Exciting.